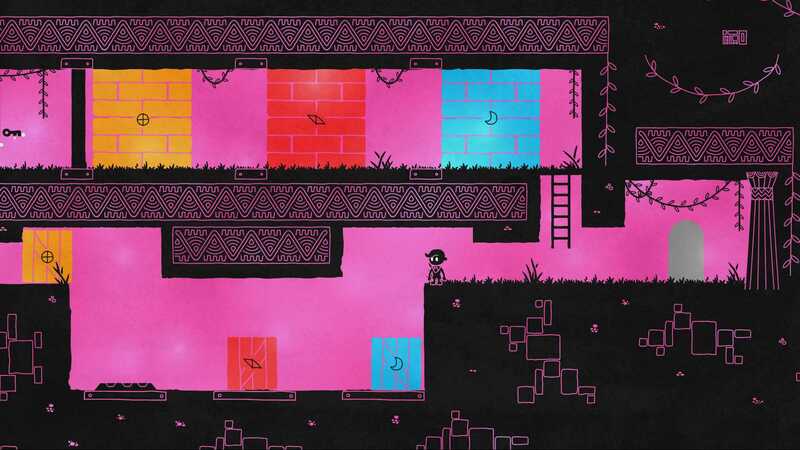 Hue is a simplistic 2D puzzle-platformer, with a focus on colour, that tells the powerful story of an abandoned son searching for his lost mother. It’s not the first of its kind and it won’t be the last, but it is a rather good one. Hue opens with the titular character having been alone for some time since his mother’s disappearance when she suddenly appears to him in a dream. She tells of a ring called the Annular Spectrum, a device of her own invention that allows the wearer to see colours, and of her partners attempt to steal it. This caused the ring to shatter, leaving her trapped as an unusual shade in the colour spectrum, unable to communicate with or be seen by others. Thus begins Hue’s quest to repair the device and rescue his mum. Immediately you’re immersed in Hue’s atmosphere. At its opening, the world is almost entirely monochrome, similar to Limbo, although with splashes of colour on blocks and other obstacles blocking the path forward. 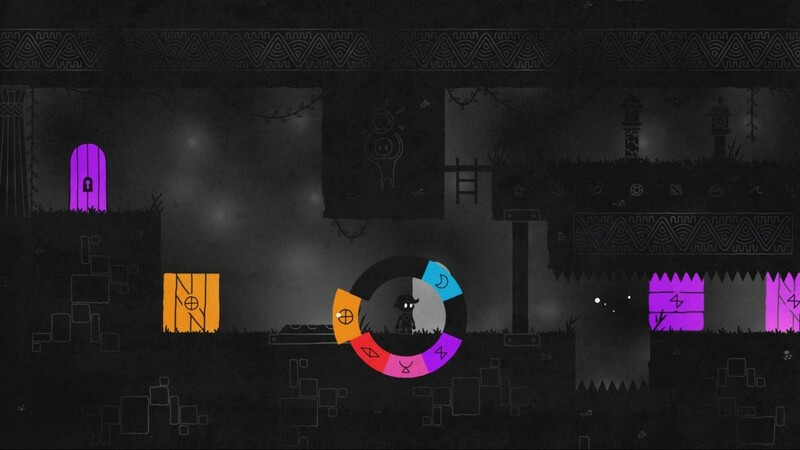 As the game progresses Hue collects fragments of the Annular Spectrum, enabling him, and you, to see new colours in the world and to pass through obstacles of that shade. Each time you do Hue also collects a letter from dear old mum, revealing details of the events leading to the mysterious Dr Grey’s betrayal, along with some trivia on the colour you’ve collected -and all the while soft piano music plays in the background, adding to this emotional journey. As you would expect, as more of the Spectrum is collected and the world becomes more and more colourful, the puzzles become increasingly complex. The controls, though, are very simple. Hue is limited to running and jumping with the left stick and A, while the Annular Spectrum is represented by the right stick, meaning colours can be selected and swapped by moving it in any of the eight directions. There’s also a colour blind option that adds symbols to the wheel and to obstacles, allowing them to be matched that way. Opening the wheel causes time to slow down somewhat too, a necessary addition in the platforming-heavy sections that often see Hue race across falling blocks or flee from boulders, Indy style, but even when you’ve learned where each colour is on the wheel it can still be tricky to select the right one. Several of my deaths came about because I swapped to the colour right next to the one I actually wanted. Despite this, as a lover of platforming, these fast paced-levels were the highlight, but puzzles form the bulk of the levels in Hue, with the focus on pushing blocks around to reach platforms and activate switches. You might be thinking that doesn’t sound like much fun and, for the first hour or so, neither did I. When there’s only a few colours to work with early on the puzzles are very simple and pretty dull. In truth, after my first short play session I was in no rush for another go, but thankfully that feeling didn’t last long, as with new colours, each area adds new elements to complicate things. When falling skulls are trying crush you, balloons are lifting blocks into the air and coloured sludge is painting your boxes, Hue provides a seriously challenging and enjoyable experience that left my head thoroughly scratched at times. It’s a slow starter, but give it a chance and Hue blossoms into a stunning, fun, yet challenging puzzle game with some quick platforming to break it up.